British orbital launch vehicle. Britain's only indigenous launch vehicle. Following cancellation of the project in July 1971, one final launch was permitted, which successfully placed the Prospero satellite in orbit. AKA: BlackArrow. Status: Retired 1971. First Launch: 1969-06-27. Last Launch: 1971-10-28. Number: 4 . Payload: 73 kg (160 lb). Thrust: 222.40 kN (49,998 lbf). Gross mass: 18,130 kg (39,960 lb). Height: 13.00 m (42.00 ft). Diameter: 1.98 m (6.49 ft). Apogee: 200 km (120 mi). Used unique propellant combination and large number of simple motors. Black Arrow was a three stage vehicle. The first stage had an 8 chamber layout with 4 pairs of Gamma engines gimbaled as with Black Knight giving thrust in all axes. The second stage had two Gamma chambers with extended nozzles to give full expansion in vacuum. Both engines were gimbaled to provide thrust in three axes. 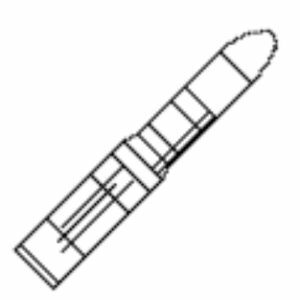 The third stage for Black Arrow was a Waxwing solid rocket motor manufactured by RPE Westcott. LEO Payload: 73 kg (160 lb) to a 200 km orbit. Flyaway Unit Cost 1985$: 8.000 million. Black Arrow (2 Stage) Two stage suborbital test version of Black Arrow. Family: orbital launch vehicle. Country: UK. Engines: Gamma 2, Gamma 8. Spacecraft: Prospero. Launch Sites: Woomera, Woomera LA5B. Stages: Black Arrow-2, Black Arrow-1, Black Arrow-3. Agency: Royal Aerospace Establishment. Bibliography: 126, 17, 2, 247, 6. 1969 June 27 - . 22:58 GMT - . Launch Site: Woomera. 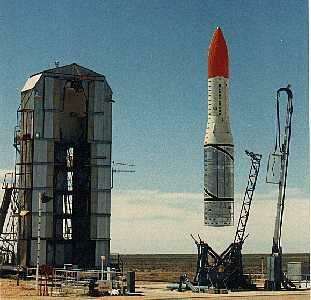 Launch Complex: Woomera LA5B. 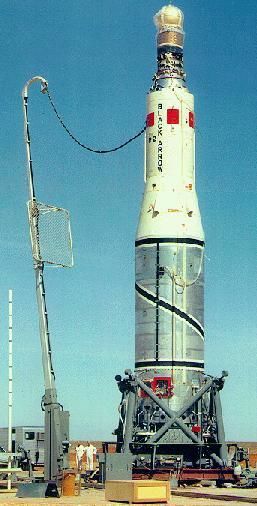 Launch Vehicle: Black Arrow. FAILURE: Control lost after 50 sec. Destroyed by range safety.. Failed Stage: 1. Nation: UK. Agency: Royal Aerospace Establishment. Apogee: 4.00 km (2.40 mi). Suborbital research and development flight. 1970 March 3 - . 21:15 GMT - . Launch Site: Woomera. Launch Complex: Woomera LA5B. Launch Vehicle: Black Arrow. Nation: UK. Agency: Royal Aerospace Establishment. Apogee: 550 km (340 mi). Successful suborbital research and development flight. 1970 September 2 - . 00:34 GMT - . Launch Site: Woomera. Launch Complex: Woomera LA5B. Launch Vehicle: Black Arrow. FAILURE: Second stage shut down 13 seconds early.. Failed Stage: 2. Orba - . Payload: X 2. Mass: 66 kg (145 lb). Nation: UK. Agency: Royal Aerospace Establishment. Class: Earth. Type: Micrometeoroid satellite. Spacecraft: Prospero. Decay Date: 1970-09-02 . Apogee: 550 km (340 mi). Unsuccessful attempt to orbit a satellite..
1971 October 28 - . 04:09 GMT - . Launch Site: Woomera. Launch Complex: Woomera LA5B. Launch Vehicle: Black Arrow. Prospero - . Payload: X 3. Mass: 66 kg (145 lb). Nation: UK. Agency: Royal Aerospace Establishment. Class: Earth. Type: Micrometeoroid satellite. Spacecraft: Prospero. USAF Sat Cat: 5580 . COSPAR: 1971-093A. Apogee: 1,403 km (871 mi). Perigee: 531 km (329 mi). Inclination: 82.00 deg. Period: 104.40 min. To test in space equipment for future satellites and to conduct a scientific experiment to measure the incidence of micro-meteoroids. Launch time 0409 GMT, injection point 13.7 deg S, 137.9 deg E. Anticipated life 100 years. .